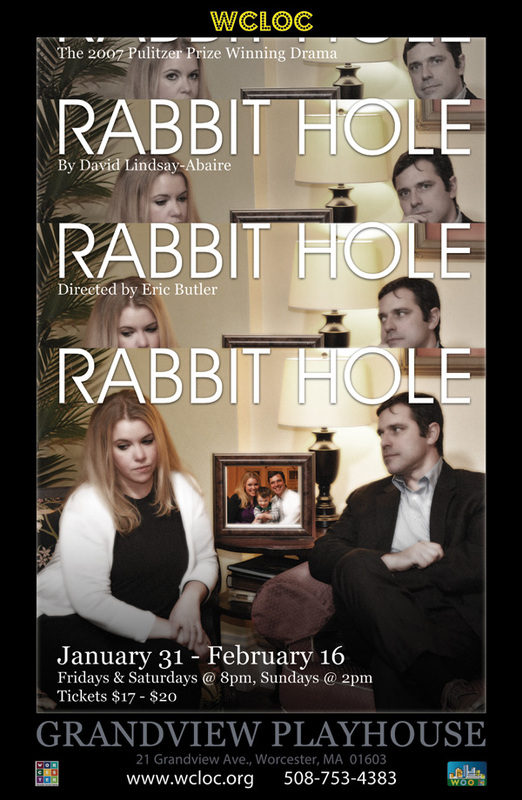 Back in January I created this poster for a production of Rabbit Hole. The Pulitzer Prize-winning play deals with a family that has recently lost their young boy in tragic accident and how they cope with their grief. A beautiful and heartbreaking piece. The director, Eric Butler, had the concept of the photograph of the happy family between the grieving couple. The photographer, Paul Bobkowski, took a number of pictures for both settings, with me to the side saying, “look this way,” “look that way,” “look at her,” etc. 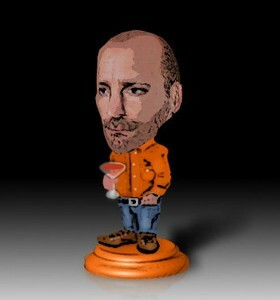 Really, it was to find the right pose for the final poster. When I received the photos, though, there were several that I liked, and they were all so similar, that it occurred to me that I could use multiple photos to multiple effect: to show the deterioration and inner thoughts of the couple, and to demonstrate a sci-fi concept discussed in the play where there exist multiple parallels of our world with sometimes slight and sometimes major differences (your basic multiverse set-up, and the reason for the shows title, where you could fall through a rabbit hole into another, better world). Moving forward with that, I created a more ethereal feel for “reality” and a more saturated and warmer feel for the photograph itself. The multiple photographs also suggested the repeat of the title, which allowed for a nice and natural separation of all the credits and tagline. I rarely get to work with photographs in my posters, due often to the fact that a) I am not a photographer, and b) the posters usually come before there are costumes and sometimes a cast. This was a fun change for me, and I was really pleased with the result.